The stunning tropical scenery in Sanya has attracted many couples from all over the country to have their wedding photos taken during the week-long holiday. Among them were some betrothed couples who wanted to experience the romantic atmosphere. Others had been married for many years and wished to recall the sweet memories of their weddings, with some taking along their children to have family photos taken. 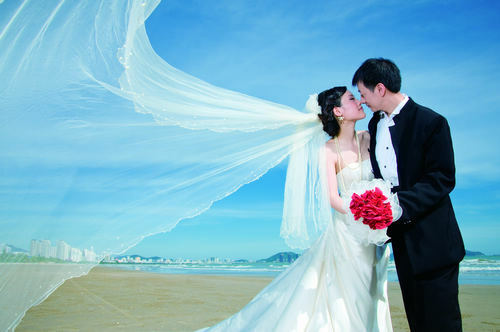 This year, the local tourism bureau and travel agencies are collaborating to promote the city’s wedding industry and tourism as Sanya is a prime location for weddings with its tropical scenery including stunning its coastline and pristine beaches, green palm trees and a wide choice of star-hotels for the all-important wedding receptions.